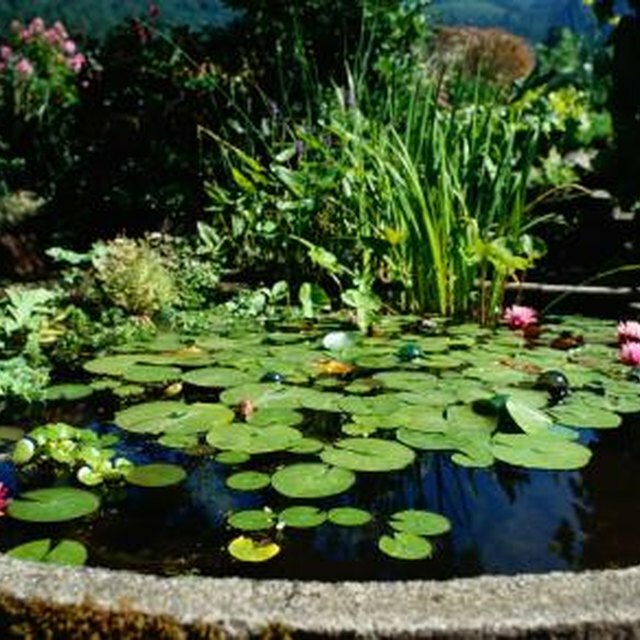 When your pond liner is damaged, you may notice the water level of the pond quickly lowering, indicating a leak. You may need to drain the pond completely just to identify where the damage is. Or perhaps you will need only to lower the water level to expose the damage. Don't be intimidated by the project: All you need to repair a flexible pond liner is some glue and a piece of liner. Remove any fish from the pond, placing them in a holding tank or holding pond. Drain the water from the pond. This step can be skipped if the damage is close enough to the surface that it can be fixed without completely draining the pond. Inspect the pond liner and identify the damaged area. You do not need to remove the liner from the pond. Cut a patch out of liner material left over from when the pond was initially installed. It needs to be large enough to cover the damage. Clean the damaged area and liner patch with salt and a damp cloth or brush, and pat dry with a soft towel, taking care to not damage the liner any further when cleaning. Use a hair dryer to heat the damaged pond liner and patch, but be careful not to melt the liner. The liner should be warm, not hot. Apply a coat of PVC sheet cement to the patch and to the damaged liner, then use the hair dryer to dry the glue at 80 degrees for three minutes and 50 degrees for the next eight minutes. Once the glue is no longer sticky, apply the patch to cover the hole. Make sure it is completely flat--with no wrinkles--and apply pressure. Once the glue has set, replace drained water and the fish if they were removed. EPDM rubber pond liners require special cleaner and glue. Both are included in pond repair kits, which you can buy at any pond supply store that sells EPDM liners. Read the instructions in the repair kit ,and clean the damaged area with the provided cleaner. Follow the instructions for applying the glue and patch. Some patches in the kit come with pre-applied adhesive that's covered with foil or paper. You need only peel off the covering and apply the patch to the damaged site. Apply the patch completely flat with no holes or wrinkles to let water escape.